First off, I have never been heavy. I was heavier when I was in high school but since becoming an Elite Trainer, I am thinner and way more fit/healthy than I ever was. I do have experience with losing weight since have 2 kids. Here's a picture of my journey in a small snapshot (you can read all about it under My Journey tab). That was after baby #2. I am still on my journey with different goals each month. 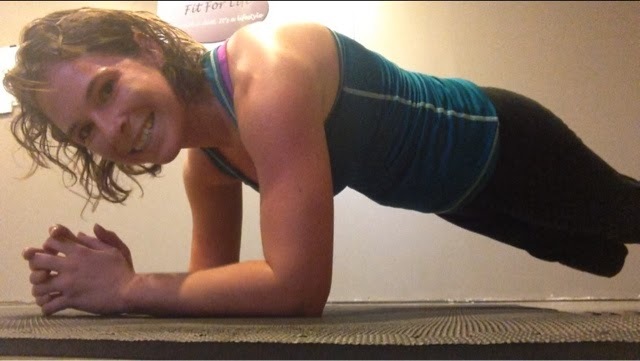 Being fit can be fun! I saw this comment on facebook just today, "I cut out soda for 16 days, ate healthy and I've exercised 5 days in a row, only to gain 2 pounds." First of all, ouch. That stinks. Second of all, how many of you have been there? You feel like you're sacrficing your world, only to get shot down on the scale! Well, weight loss has many factors (hence how many things I am going to touch on). And let me say that it's not a race, it is a journey. Losing weight is essentially dying to yourself. It's one facet of your life that means you have some things to give up but you gain a whole bunch of good things. If you're a Christian, there was a point when you said, "Ok God, not my will but yours. I want to follow You." That is dying to yourself. We have to do it everyday. When you get married you die to yourself when it comes to issues with your spouse. You are no longer a separate entity, you become one. Having kids requires A LOT of dying to yourself to nurture and take care of helpless beings you bring into the world. BUT, yes there is a but, we all know the gains of each of these things. As a Christian you experience freedom, joy, peace, and an everlasting life with a God who is madly in love with you. As a spouse you enjoy a close relationship with the one you will love and spend the rest of your life with. And as a parent you get such joy in raising your children and a bond that can never be broken. So with losing weight, there are things you may have to change. Things you have to give up. But the gains are so great. I mean really, things like not being addicted to food, enjoying seeing yourself in the mirror, wearing clothes that fit great, less health issues, more energy, better oxygen intake, more joy in activities, and the list goes on and on. So let's look at some things I'd like to highlight. 1. Mentally Deciding- this may seem simple but it's really more than just looking at yourself in the mirror or in a picture and saying, "yuck I look gross, I need to lose weight." It's taking a hard look at what you're doing when you eat, your schedule, if you are or aren't exercising, and asking God to really change your heart about this. Losing weight is a heart issue, bottom line. Are you willing to change? If not, then why? What's at the root of it? Sometimes this is a long process. No one is perfect. Remember that. But if you seek guidance from the One who can help you, He will fill in the gaps of your weaknesses. 2. Figure out what foods don't work for your body- once you have decided, start targeting the foods you eat. List out what symptoms you might have of being lactose intolerant or a wheat sensitivity. Just write down how you feel most of the time and especially shortly after you eat a meal. You can do an elmination diet to see what foods you might be sensitive to (need to limit). For example, I found that I am lactose intolerant and my body doesn't like fried food or grains that much. So I stay away from milk, limit ice cream and rarely get fried food. I still eat grains but try to cut them out for most of the day. The biggest things that people usually have issues with are dairy, grains, corn, and meat. It seems that meat is the least people have issues with and if you get grassfed meat, issues decrease because the quality is totally different. 3. Fruits and Vegetables- Increase your daily intake of fruits and vegetables! This is so important for weight loss. I mean it really is crucial. Our bodies need vitamins and minerals to be healthy. There's macronutrients (carbs, fats, proteins) and micronutrients (vitamins and minerals); fruits and vegetables are both. They provide essential vitamins and minerals while usually being on the carbohydrates side mainly but some have good amounts of proteins. It's not just enough to cut out junk foods, you need to fuel your body correctly to thrive. Just start googling fruits and vegetables health benefits. I guarantee you'll be blown away by how healthy each one is and see how getting a variety will improve your health plus help you lose weight and maintain a healthy weight. 4. Remove Processed Foods- I feel like we should all know this but I need to touch on it. This is CRITICAL to losing weight and being healthy. Ditch the frozen dinner "health" dishes and desserts. Calories are not the most important thing to losing weight. The quality of your calories is serious. If you want to eat a little dessert, by golly get the full fat ice cream and leave it at that. Your body will actually be able to metabolize it and use nutrients in it for good; not just confuse your body and make things worse. Plus, it's not about eating 3 candy bars a day and staying under 1000 calories to lose weight. Can you say muscle loss? Health problems? Heart attack? Yes, it will make you more unhealthy doing that. 5. Eat Whole Foods- so we want to remove processed but add what our bodies really need, real food. Remove the margarine and buy butter. Breaking News!!! Eating the real thing tastes better and is better for you. Want french fries? Cut up some real potatoes, toss in olive oil, season and bake in the oven. Chicken nuggets? Use my recipe and make real chicken nuggets without all the chemical crap that restaurants use in it and fry in crappy oil. Tastes better, is more filling, and again, your body can metabolize it properly. So stay on the outside of the grocery store (perimeter) because that is where most of your whole foods are. They are perishable. I know, that means you have to shop more frequently. But it's worth it. 6. Eat Frequently- yes. Read that carefully. I am giving you permission to eat every few hours. Jump for joy! Eating every few hours boosts the metabolism and curbs cravings. Be sure to really stick with a protein, fruit/vegetable. Eating a few crackers is not what I'm talking about. Protein stabilizes blood sugar, fills you up, and is used by your muscles to repair after workouts which creates more muscle. We already touched on fruits and vegetables. You will lose weight doing this. 7. Lift Weights- I cannot say this enough. LIFT HEAVY. Especially if you are a new mom. Ok here's the scoop...if there is a secret to post partum weight loss and getting your pre-pregant body shape back, it's this. Why? The more muscle in your body, the faster your metabolism. The after burn of lifting weights is incredible. You continue to burn calories for 24-48 hours AFTER your workout. With steady state cardio you burn for 4-6 hours after. Big difference. Every year after 20 years (men and women) of age, you lose a percentage of muscle mass PER YEAR. 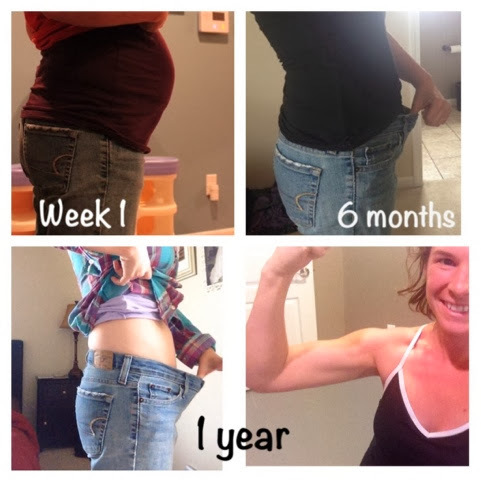 Now if you are a woman who has had 3 babies and hasn't lifted weights, well you will have gained signifcantly more body fat and lost more muscle mass than others. Why? Because you gain usually a minimum of 8-10 pounds of body fat with each pregnancy. This drastically slows the metabolism down. That is why it's so hard for you to lose weight. You need to speed up your metabolism while you're just sitting down and sleeping. Plus muscle reshapes your body, tightens, and tones your skin, and gives your muscles a more appealing look (as opposed to jiggly arm fat). 8. Change your Workouts often- do not repeat the same workouts for months on end. You need to change up what you're doing to see results. This is called periodization. Athletes do it and that's why you should....to get an athletes body! So this means if you like running, don't run at the same pace every time. Don't run the same distance. Mix in cross training and weight lifiting on off seasons (if you like running outside when it's nice). Be sure to also do light workouts after intense ones. Take a week off every few months and focus on stretching and improving balance. Same goes for any other type of workout. Your body adapts quickly and you must change so it will change. Periods of high intensity and low intensity is key! 9. Drink Water- this is another one I think we all should know but drinking water is vital to your body's health and weight loss. Your body is made up of approximately 70% water. If you don't get enough you'll get constipated, have headaches, muscle aches and pains, recover slower, etc. Water is such an easy thing to change and it will help you lose weight. Especially if you drink sugary drinks. Talk about reducing empty calories! Plus those sugary drinks spike your blood sugar which is not good for your pancreas, brain, and will lead to type 2 diabetes eventually. 10. Limit Added Sugar- if you decide to eat whole foods like I mentioned earlier, then this shouldn't be too much of a problem. But sugar is a culprit to weight loss. It is probably the number one thing that hinders it. Why? Cause it's so addictive and it's in everything! Processed foods, drinks, you name it. It keeps you wanting more. But it's so bad for you. I may have to write a whole other post on this. I'll be the first to admit I love sugary foods. I even have done posts on eliminating sugar to stop being addicted after my pregnancies. Let me say that I am not talking about sugar found naturally in fruits. I am talking about added sugars. Big difference. We already talked on how healthy fruits are, so don't get confused. 11. Lifestyle- if you really want to lose weight then you must make this a lifestyle change. The slogan of my fitness business was, "It's not a diet, it's a lifestyle." This process never ends so don't think it'll only take 3 months to lose x amount of weight. It takes time. Healthy weight loss is a gradual process. Your body can only remove so much fat at once (without taking muscle with it). It's science, really. If you've abused your body for years you cannot realistically expect it to change over the course of a couple months (even if you're a fan of Biggest Loser). You need consitency once you start. No turning back. See this as the start of a journey to being healthy and making changes that will help you lose the weight you need to lose but really change your body as a whole. Creating habits and influencing your family is part of that. Like I said earlier, it's deciding to die to yourself. But it does get easier. Once you die you gain new life. You will with this, I promise. I hope this information helps you on your journey and I would love to talk with anyone who has questions, encouragement, accountability, motivation, or prayer. Thank you for all who do contact me because I love hearing from you and helping you! So first of all... love this! Second of all I actually tried to tag you in my post earlier today and had no such luck, but you are my inspiration as well! I know you were the inspiration behind Lindsay 's weight loss and your posts are helping me too! Thank you for your encouragement! My mind set is where it should be now, and I'm so excited for the direction my body is headed!! :) Thanks again! !